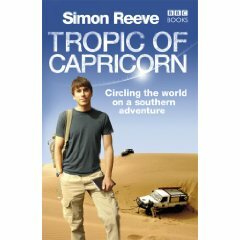 This book charts Simon Reeve and his crew’s experiences travelling along the Tropic of Capricorn. Even if you have seen the television series this book is still rich in detail and depth. I was intrigued to learn more of Reeve’s observations and opinions on these little travelled and little known places. As the book reveals it is not exactly a regular tourists destination and route. The journey took him through Namibia, Botswana, South Africa, Mozambique, Madagascar, Australia, Chile, Argentina, Paraguay and Brazil. Admittedly this is a genre that has been done to death with a plethora of travel shows including celebs like Michael Palin and Charley Boorman presenting quirky travel ideas and adventures almost to saturation point. This one does offer something original and different however. Reeve is on a personal quest for knowledge to see the ‘route less travelled’ in poorer countries and in harsh environments seeing what impact good or ill the modern developed World is having on the Third World. Some may find Reeve’s style and brand of observation a little too ‘right-on’ and preachy at times but generally I found this book offered fascinating insights into places and subjects that I had little or no knowledge about. His journey into the African countries for example reveals former European colonies all suffering from poverty and inequality, corruption and HIV/AIDS. The divide between the rich and poor could not be greater and the Chinese in the East as well as the Western World is still exploiting Africa for its mineral wealth. Reeve’s book is packed with social commentary and he is certainly not reticent in expressing his outrage and anger. The book is not all doom and gloom as he warmly recounts many encounters with the guides he meets in each country as well as the people there. Among those he befriends are wildlife conservationists and philanthropists. He really does shine when describing encounters with other people revealing a broad and detailed tapestry. I found myself rewarded with a much bigger picture than if he had just focussed on the travel itself. He really is at pains to explain exactly what issues face each country on a daily basis. In South America he highlights the problems of deforestation, drugs, smuggling, crime, corruption and poverty. There are still rays of sunshine to be found through all these dark clouds but Reeve does not in any way try to sugarcoat or gloss over anything that he perceives as unjust. This is an educational and rewarding experience for the reader and there is much to be gleaned from it on many levels: as a travelogue, a unique adventure and an expose on exactly how our World functions.